Process capability studies tells you how well your process or product meets specifications. Process capability baseline numbers predicts current and future defects for any given measurement characteristic. The term for process capability is CpK. The closer the data average is to the nominal specification, the higher the Cpk. Definition of a defect: When a part is beyond the specification, the part is consider a defect. 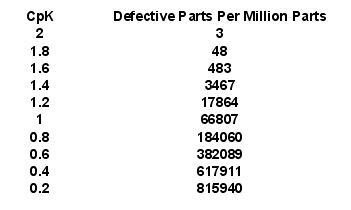 See the below table for calculation of defects per million parts after calculating the CpK. Capability is just one of the many performance metrics available in six sigma metrics. Others include throughput, Overall Equipment Effectiveness, cycle-time, and so on. It comes in two forms which depends on your type of data , variable and attribute. Both look at performance versus specification(s). Here we focus on the application of attribute type data. For a detail look at variable data then please visit this page. There can be multiple defect types for each unit and multiple defects of each type per unit. When evaluating DPU, you decide on the definition. DPU could mean the total of all the individual defects (or errors) on each unit. Or it can be applied to individual defect types, thus identifying which defect type is creates the largest loss.You can count defects per unit, or count units defective. You generally use attributes to identify opportunities by prioritizing based on the commonest defect type (typically using a Pareto Chart). Process capability studies are a basic tool of process improvement. Understanding MSA (Measurement System Analysis) with Process Capability.